We design and manufacture fixed remote base stations. These include self-contained huts with freestanding towers or masts that can be remotely managed and monitored. Huts vary in size from small shelters that contain one rack and batteries, to large shelters with multiple racks and full power management systems. Air conditioning and passive cooling options are available. 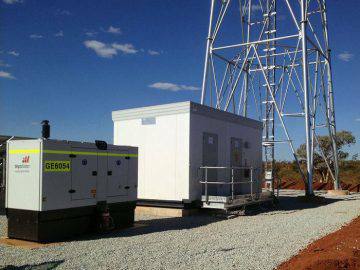 Monitoring of systems can be integrated into FMS systems for power levels, solar charging status, generator status, fuel levels, and hut conditions via general alarms. Towers and masts are tailored using advanced coverage and path profiling software to get maximum signal and link reliabilityandare constructed to withstand the harshest of conditions including lightning strikes and cyclones.